August 27, 2013 DOHA: Noted Qatar-based Islamic scholar and President of the International Union of Muslim Scholars, Dr Yousuf Al Qaradawi, has vehemently criticised former Egyptian Grand Mufti Ali Al Gomaa for his recent fatwa (religious edict) justifying the military crackdown on supporters of the ousted president Mohammed Mursi. During a weekly programme (Shariah and Life) on Al Jazeera on Sunday, Al Qaradawi described Gomaa as a puppet of the military-led interim government. He said Mursi is still the legitimate president and those who toppled him are Al Khawarij (one who rebels against the acknowledged Muslim ruler). ‘Ali Gomaa is not a Mufti. He is a slave of the police and those in power. 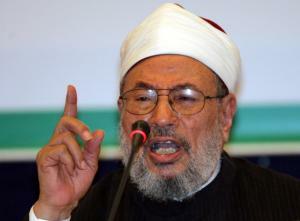 He denounced people demonstrating against the military coup that ousted elected president Mursi,’ Al Qaradawi said. He said Gomaa should direct his fatwa towards Army chief General Abdel Fattah Al Sisi who breached his oath that he will obey the elected president. ‘Those giving permission to kill innocent people can not guide the nation. They won’t have any value with the learned people. A real scholar is one who fears Allah and stands by the Holy Quran and the Sunnah (tradition of the Prophet (PBUH)),’ said Al Qaradawi. In July, the GMBDW reported that Qaradawi had issued a fatwa condemning the deposing of Mohamed Morsi as President and calling on Egyptians to support Dr. Morsi.